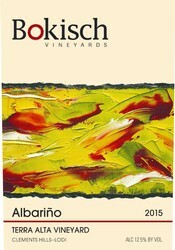 Sunset International Wine Competition 2017 has awarded our 2016 Bokisch Vineyards Albariño, Terra Alta Vineyards a Gold, Best of Class! Two vintages,2015 and 2016, of our Albariño, Terra Alta Vineyard were awarded a Gold Medal and a Best of Class! Our 2016 vintage is only available to members, but you can still get your hands on some 2015 while supplies last. Let raise our glasses and salut to Sunset! We're honored to earn your appreciation. See all the winners here.